(1931, Tiffany) Ken Maynard, Hooper Atchley, Lina Basquette. A top-of-the-line early B western. 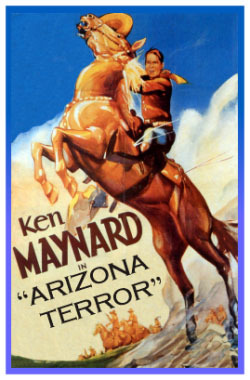 Ken is dry-gulched by four thugs who buy horses and then commit murder to get their cash back. Ken ends up framed for one of the killings! He clears himself though, with the aid of a Mexican bandit. Tarzan never looked better, doing some great stunts and two eye-popping jumps over a big wall. Lots of terrific riding and chases. Mucho recommended. From 16mm.